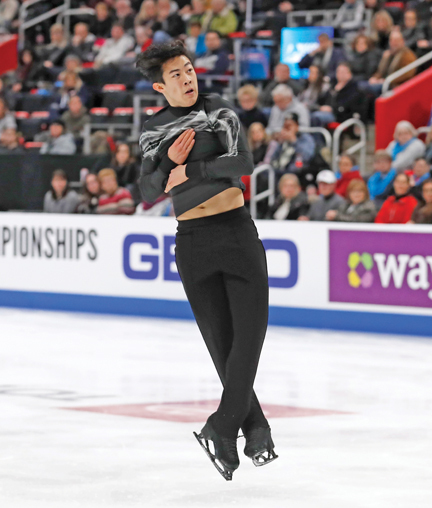 DETROIT — Nathan Chen was skating up to collect his medal — gold, of course — when he tripped on the small carpet in front of the podium and nearly fell. So maybe he’s not perfect. Until then, there was hardly any hint of a misstep for Chen, who lived up to his own impressive standard by winning his third straight title at the U.S. Figure Skating Championships. The reigning world champion, Chen was biggest star at this competition coming in, and he won the final event Sunday with a score of 342.22 — over 58 points more than runner-up Vincent Zhou. Jason Brown was third. Chen’s free skate alone earned 228.80 points, which was higher than the total score for 14 of the 20 skaters. The 19-year-old Chen landed four quad jumps in his routine, one of which was in combination. When he wasn’t impressing with his jumping ability, he kept the crowd captivated with his easy, elegant skating to “Land of All” by Woodkid.